Three of our district leaders, including Dr. Trujillo, have been named Certified Microsoft Innovators! Dr. Gabriel Trujillo, Superintendent, Tucson Unified School District has achieved Certified Microsoft Innovative Educator. MIEs use Microsoft Tools and have learned the fundamentals of applying technology in education. They have joined a professional network of enthusiastic educators who come together to learn, share, and grow. Blaine Young, Chief Technology Officer, Tucson Unified School District, and Rabih Hamadeh, Director of Information Technology Infrastructure, Tucson Unified School District, have both achieved Microsoft Innovative Educator Master Trainer. MIE Trainers and Master Trainers are educators, government or district personnel who train educators and school leaders on the effective use of technology in teaching and learning and work to transform education in the digital age. 7500 MIE Experts on the planet... 14 in Arizona... 9 in Tucson Unified School District. And now 3 more! 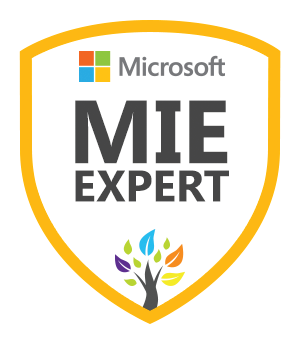 Learn more about MIE Experts and all things IT by taking a look at the first edition of their newsletter, Ennovate.